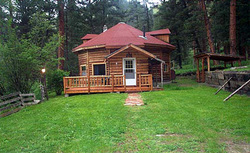 The Round Cabin is 2 stories tall and built from logs. It sits across the county road from the East Fork of the Bitterroot River within a Big Horn Sheep habitat zone. The cabin is very private and abundant with wild animal visitors, so be sure to bring your camera. The cabin offers a full kitchen and there is a restaurant nearby for those times when you don't feel like cooking. There are two bedrooms, one closed in and one open loft; 3 beds, 1 full, 1 queen and 1 sofa double sleeper; laundry facilities, outdoor barbecue and fishing access. Various other amenities also include a microwave, deck, books, picnic area, and VCR with movies. Activities onsite include hiking, fishing, photography and wildlife viewing. Nearby activities include art galleries, ATV rentals, back country trips, bike rentals, bird watching, cultural events, downhill skiing, fishing and fishing instruction, floating, gold panning, golfing, hiking, horse packing, horseback riding, historic, hunting, interpretive talks, kayaking, Lewis & Clark sites, museum visits, nordic skiing, photography, rafting, rock climbing, rodeos, sapphire digging, scenic flights, shopping, snow shoeing, swimming and wildlife viewing. The cabin is only 8 miles off of Highway 93, making it the perfect setting to just kick back, relax and enjoy the wildlife viewing and scenery. Children under 8 stay free and long term renting is possible. Directions: The Round Cabin is located out of Sula. Highway 93 south to Sula. Turn east on East Fork Road. 8 miles east.